In that time we've learned a thing or two about the job - what people want and how best to supply those services. We will listen (and remember!) special requests. We won't send a different cleaner every time - our aim is to have someone you know and who knows you cleaning your home or business. 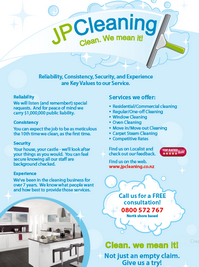 We will provide you with a high quality service at reasonable rates, using experienced staff who know their job. We will maintain a consistent standard of work that won't fall off over time. We carry $1,000,000 in public liability insurance to give you peace of mind, and the knowledge you're in safe and responsible hands. 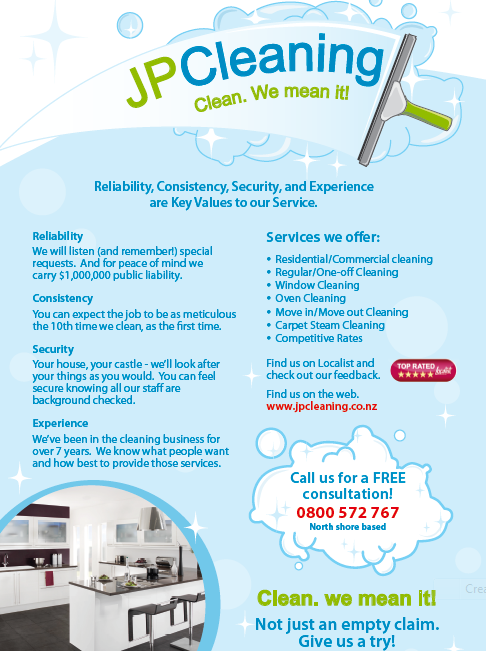 Our regular home cleaning & office cleaning services currently covers Auckland City Central, North Shore, Upper Harbour areas. We use 100% natural citrus based cleaning products. Effective, safe for you, and the environment. Plus they leave a pleasant natural scent. We use a colour coding system on all our cleaning materials to ensure no bacterial transfer occurs between areas. Contact us today on 0800 57 27 67, or Email, for your free on-site quote. Also can follow us on Facebook , Google + and NZ Search pages. Thank you so very much for all your help and expertise yesterday, the cottage has never looked like this before.